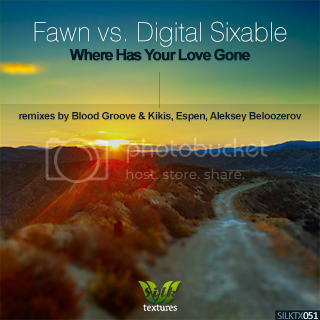 On our latest Silk Textures release, Fawn & Digital Sixable's soulful romantic ballad "Where Has Your Love Gone" has been given the deep-prog treatment by 3 of our imprint's finest talents: Blood Groove & Kikis, Espen, & Aleksey Beloozerov. Blood Groove & Kikis, the consistently superlative Latvian duo, serve up the first interpretation, centering a cavernous, "classic" deep house bassline Their talent for rhythm is matched by their ability to weave gorgeous, crystalline melodies into their productions. The evocative melodic layers slowly crescendo until, finally, we are met by Fawn's cathartic, titular vocal hook. Espen is a celebrated house artist from Norway, who has remained active for nearly a decade. A much more moody and deep soundscape is created early, while an up-tempo groove keeps the track chugging along. Various vocal stabs puncture the melody, while delicate bell sounds also add textures to the late-night, lost-underground atmosphere. Finally, another accomplished veteran of house music, Aleksey Beloozerov, rounds out the package. His take is more downtempo than deep house, though a light rhythm offers groove elements in various sections of the arrangement. Mainly, this inspired, soulful take allows Fawn's contemplative, achingly beautiful vocals to really shine. Subtle acoustic instrumentation offers a suitably delicate backdrop to the touching lyrics.